For me, this has been a year to try to break out of my sedentary habits. Most days I am reasonably content to come home from work and mostly read and consume some media. My daily walks and cycling take me out of part of those habits. When it comes to travel and going somewhere, for me, I just put it off. Sounds like a good idea, but timing and logistics usually make me keep putting it off. 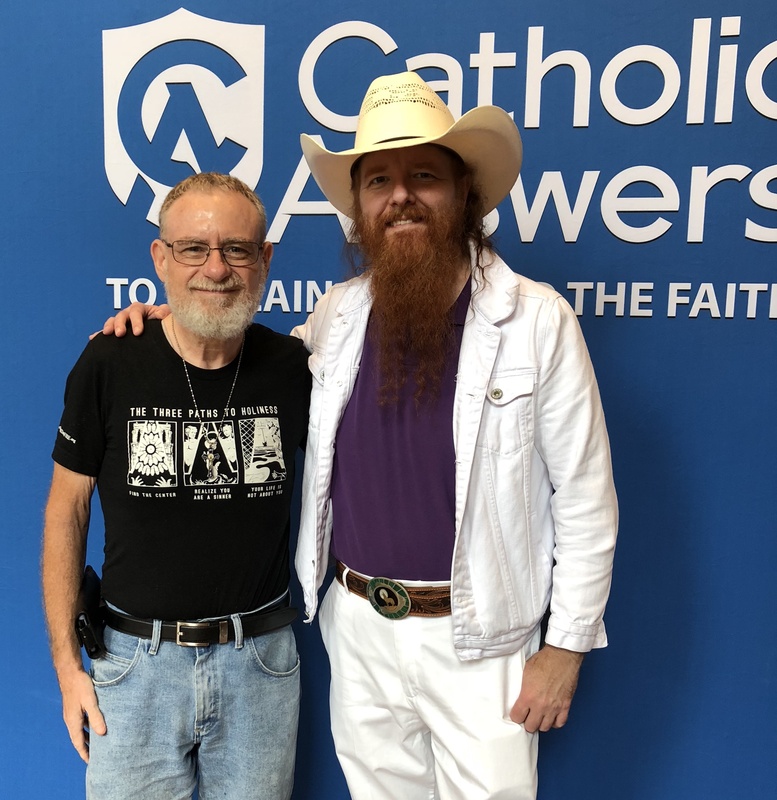 This year the Catholic Answers Conference was on the topic of “Faith and Science.” If anything was going to get me to travel, that topic is geared primarily for me. Plus there were the people there I desired to meet. Catholic Answers has played such an active part in my coming to know the Catholic faith along with help in continue conversion. When I first moved to Jacksonville, Fl after retiring from the Navy, I was in my seeking phase after having lost my faith in atheism. At the time there were only three Catholic radio stations in the country, and thankfully Jacksonville was one of them. 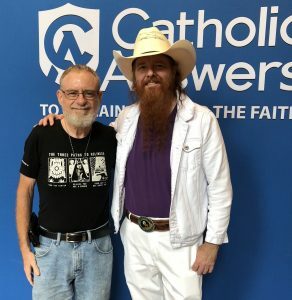 Catholic Answers Live started broadcasting in January 1998, which was just months after my move. So I have listened to almost every show they have aired over the years. Although, it has been virtually entirely via their podcast since that option became available. Podcasts allow me to skip those answers to the common questions quickly. Questions that I have heard so many times before. It was strange watching them do live versions of Catholic Answers Live as it seemed so slow to me. My podcast app of choice I listen at 3X speed with silences removed. It took me some years of listening to increased speeds to make this intelligible to me and not to drop information. So last week I packed my bag and went to that convention. So after registering at the Hyatt Regency in San Diego, I went downstairs to complete registration for the conference. The first thing I noticed was Jimmy Akin standing and talking to some people. A big fanboy moment for me. I owe such a debt to Jimmy Akin in multiple ways, and I have learned so much from him over the years. Added to that was his public posting about his efforts to lose weight that got me to lose 145 pounds. So it was such a joy to walk over to meet him and talk to him. He is someone I could listen to and interact with for days upon days. 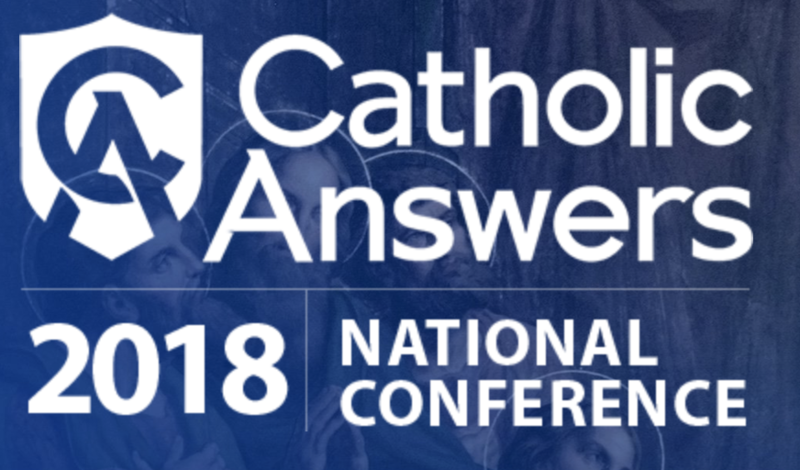 Although like all my interactions at the conference with the Catholic Answers hosts and support team, I was aware of not monopolizing their time. There were around a thousand people at the conference and thus many people who would take delight in these meetups. Just glad I had the opportunity to meet these people who have been so part of my life. The first night they had Stacy Trasancos talk about “Science for Believers” followed by Karlo Broussard “Why Science Cannot Eliminate God.” Thoroughly enjoyed both of these talks. Stacy’s involved part of her conversion story from no faith into the Church. Loved her viewpoint as a chemist and seeing the wonder of the world and the complex interconnectedness of ecological systems we hardly reflect on. Karlo’s talk took a more philosophical approach. Considering St. Thomas Aquinas influence on my faith, I was down with that. Both speeches were quite humorous at times. The night ended with Jimmy Akin calling a square dance. Now I already knew he calls square dances locally and that this one would be for beginners. So I figured we would only learn a couple of steps and make use of them. The sequences he taught and called were more advanced than what I expected, but not beyond picking up quickly. I thoroughly enjoyed myself, as did my two left feet. Over the following couple of days, there were talks from Jimmy Akin, Father Terrence Ehrman, Trent Horn, Tim Staples, and Chris Check. Along with two episodes of Catholic Answers Live – live and a Q&A panel with their apologists. Saturday night included a dinner Banquet followed by a keynote address by Cardinal Burke. So I was pretty much rapt in attention during all the talks. The talks were so worthwhile and added to the general information that I knew. The interaction between the various apologists on the Q&A panel was a lot of fun. As you would expect, they had Mass each morning. The fact that they were Ad Orientum delighted me. Even though on Sundays I experience that aspect during the TLM, having this done for the Ordinary Form was striking for me. The idea that this helps you to orient towards worship is true for me. I can see how this can be offputting for many people. I think this is a misunderstanding that could easily be corrected, at least over time. I am entirely for the idea of this being the default orientation for all Masses. I don’t expect this to happen anytime soon or in my lifetime. Still, it was a joy to experience it and being helped in worship. I need all the help I can get when it comes to prayer. Fr. Hugh Barbour’s homily was outstanding. So much depth to it. The kind of homily that makes you wish this was a daily experience. The problem with great preaching is all the times you don’t have great preaching by comparison. He is one of the Norbertine Fathers from St Michael’s Abbey. I kept thinking he was a Dominican based on the preaching, especially since they both wear white habits. I found my trip to San Diego for this event to be worthwhile. I had a great time. I already signed up for next year’s conference. While I do so enjoy meeting people, being so socially awkward I have a hard time doing this. I like structured meet-ups that can make this more comfortable for me. At the Chesterton conference I went to, they included all meals, and the impetus was to sit with different people each time. This setup works for me. The only meal included for this conference was the Dinner Banquet. Other meals we would provide for yourself, mainly in the hotel. I do understand that they worked hard to keep the price down for the conference and it is a bargain. Providing meals as part of the fee would no doubt put it out of reach for some people. Still, I did manage to get to interact with other attendees and met some interesting people. It is a joy to talk about the faith with serious Catholics. Had some great conversations. I do wish that the Mass they had on the final Sunday would have been earlier. I noticed many people checking out of the hotel before Mass was to start at 9:00 am. 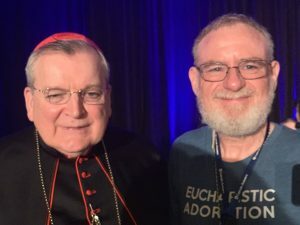 If I didn’t have a plane flight out, I would have loved going to that Mass with Cardinal Burke. The night before I squeezed in a vigil Mass at a local parish since I would be traveling pretty much all of Sunday. After the Masses at the event, it was a disappointment to take the liturgical time machine back to the seventies at this local parish. Next year I will make sure that I spend a little more time in San Diego and don’t return home on a Sunday. While I know you can miss Mass when traveling or get a dispensation, I don’t want ever to miss Mass. Plus I want to visit the USS Midway Museum. The U.S.S. Midway (CV–41) is the first carrier I was stationed on, and thus I have a lot of fond memories of her. I find it sad that out of four Aircraft Carriers I was attached to, that only one is still in active service. That comment and all concerned about it reminded me of the early seventies when me and a good friend of mine Tom (God Bless his soul) took about a week or so of a beginners square dance class. He had just gotten out of military service after 3 years… Anyway, we had a great teacher and so much fun in their home that one of us accidently broke a china cabinet class and everyone was happy to chip in and have it replaced. God Bless you and please keep praying for me also.